There's a very new, very fast, very expensive car sitting in my driveway. There are lots of people who speculate what pastors should drive. Google it. I don't think a new BMW 535xi is on anyone's list, except maybe the prosperity gospel hucksters'. I have a bit of a soft spot for old German cars. I've never owned a new car and never even made a car payment. I've owned one car from the same decade in which it was made, and then only for the few remaining months of 1999. Owning cars that are half as old as I am (and older) has caused me to learn to do a fair amount of my own work on them, so I can drive something that's a bit higher mileage after someone else has taken the hit on most of the depreciation. A couple years ago, I bought a then-12-year-old BMW 7-series. I wanted a V-8, rear wheel drive sedan (you know, something pastoral). If it were American-made, it would have helped me fit in better in Jerseyville, but American V-8 sedans are rare, and ones with different wheels for going forward and steering are rarer still. But the Germans came through. The good news is that two+ years and 35k miles later, the Kelly Blue Book Value is about the same as I paid for the car. The low price of these things used and the treasure trove of information collected on the Internet for just this model and year range of 7-series makes it the quintessential car for the casual do-it-yourselfer. Want to know how to troubleshoot the front suspension, reassemble the oil pump, or change the cabin air filters? It's all there. While I can do a lot of my own service to the car, there are a handful of things I can't do, one of which is an alignment. That takes dealer skills and tools. So I took my now 14-year-old car to a dealer in St. Louis to get the alignment done. They promised me a loaner so I could run some errands while I was in St. Louis, and the car was supposed to be done in a couple hours. That was yesterday. I have this fantasy that car manufacturers would find a need for a pastor--who is in his mind a race car driver, but who in his real life is just a pastor driving to visit his parishioners--to drive and review their cars. There are car blogs by moms, dads, teens, right-handed people, coffee drinkers, and people with multiple middle names. Why not a Lutheran pastor? Who wouldn't want to read that? Well, okay...everyone. So there it is in my driveway, a nearly-new car, as a loaner for my it-would-be-new-in-Cuba car, a car worth eleven of my cars (seriously), a car that depreciates more than a dollar a mile. But man is it fun to drive. And when people see the guy in a clerical collar driving it, they must conclude I'm one of those fat-cat, synodical bureaucrats. Labels: Jerseyville life, just for fun, what would Jesus drive? Lutherans have never been dogmatic about a number of sacraments like Roman Catholics are, except that they adamantly deny that there are seven. In some places, the Lutherans say there are two sacraments; in other places, they say three. Baptism and the Lord’s Supper are always included in the list of Lutheran sacraments. Absolution sometimes makes the list. The word sacrament is the Latin translation of “mystery,” as when St. Paul calls pastors “stewards of the mysteries of God (1 Corinthians 4:1). Scripture never sets forth a definition of “Sacraments;” those definitions always come from theologians. What is a Sacrament? The Explanation of the Small Catechism (not a part of the Catechism, but a later American addition to help teach the Catechism) says, “A sacrament is a sacred act A. instituted by God, B. in which God Himself has joined His Word of promise to a visible element, C. and by which He offers, gives, and seals the forgiveness of sins earned by Christ.” So the question is, “Does Absolution have a visible element?” The answer: kinda. 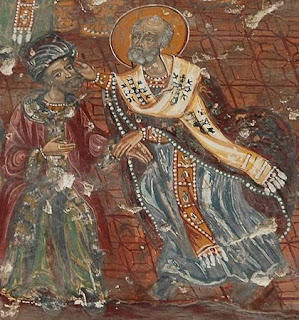 While the pastor is not an element akin to water, wine, or bread, his placing hands on the head of the penitent, is both visible and tactile, like Baptism and the Lord’s Supper. What do the Lutheran Confessions say? The Small Catechism sandwiches Confession and Absolution between The Sacrament of Holy Baptism and The Sacrament of the Altar. The Apology of the Augsburg Confession says, “If we call Sacraments ‘rites that have the command of God, and to which the promise ofgrace has been added,’ it is easy to decide what are the true sacraments. For rites instituted by human beings will not be called true sacraments. For human authority cannot promise grace. Therefore, signs set up without God’s command are not sure signs of grace, even though such signs perhaps instruct the unlearned or admonish about something. Therefore, Baptism, the Lord’s Supper, and Absolution (which is the Sacrament of Repentance) are truly Sacraments. For these rites have God’s command and the promise of grace, which is peculiar to the New Testament” (Ap AC, XIII, 3-4). The point is not to be dogmatic about a number but to receive what God has commanded as a means through which He forgives our sins. To the question, “Does Absolution forgive our sins?” the answer is a clear “Yes!” It is God’s gift, whether it gets included in our human list of Sacraments. It's that time of year again, time for what will easily become the tradition your family will cherish for years to come. 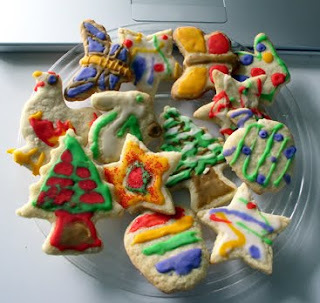 Contest is open to all readers of this blog, as well as anyone who makes great Christmas cookies. Each contestant should submit a dozen or so cookies to the author by Christmas morning. He will judge them and declare one cookie to be the Official Best Christmas Cookie in the World. In addition to world-wide acclaim and inevitable stardom, the winner will receive the privilege of having his or her recipe written down somewhere and will be offered the opportunity to bake the winning cookie for the author every year. Because of the level of prestige associated with this award and what will eventually be the long-standing lofty reputation of the contest, contestants are encouraged to enter early and enter often. The term "inactive member" is really fictional, but then again, so is Pr. Lumberg. What’s the difference between private Confession and the general confession at the beginning of the service? One of the beautiful parts of Lutheran theology is its emphasis on the particularity of the Gospel. Jesus died for the world, yes, but that’s not the Gospel until you know that Jesus died for you. The difference between the general Confession in the Preparatory Rite and the private Confession contained in the Catechism, extolled by Luther, and called a Sacrament by the Augsburg Confession, is particularity. We don’t have general sins, we have specific sins. We aren’t generally sinners, we’re particularly sinners. So the sweet comfort of forgiveness, the cure for souls, is meant to be applied and received particularly in private Confession. So the Lutheran Confessions declare, “Our people are taught that they should highly prize the Absolution as being God’s voice and pronounced by God’s command” (AC XXV) and “Our churches teach that private Absolution should be retained in the churches” (AC XI). General confession is like going to a medical seminar, led by a doctor, to address a particular health issue. While you may gain invaluable information from the seminar that you can use to improve your health, there isn’t the face-to-face contact of a visit to a doctor. In a visit to a doctor, the doctor will evaluate your particular health and prescribe a solution to benefit you in particular. General confession delivers forgiveness like a sermon and the rest of the liturgy deliver forgiveness. Private confession delivers forgiveness like a doctor writing a prescription for you. When in private Confession, the pastor puts his hand on your head and speaks the words of Christ “I forgive you,” there’s no mistaking it. This cure is for you.